I’ve been sick for like, forever. (Okay, I’m exaggerating. Realistically, it’s been a week and a half. But that feels like forever!) And it seems like no matter how much Robitussin and Sudafed I take, I’ve yet to really start feeling better. Luckily, my blood sugar levels have been very normal throughout the entire sickness (which usually isn’t the case!). Instead I’ve faced a new quirk in diabetes-land: most cold medicines contain things like high fructose corn syrup, which is in other words, sugar! And I’ve seen noticeable blood sugar changes after having a dose of medicine. 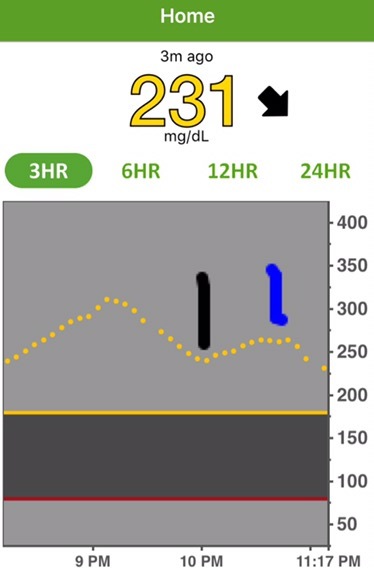 The black line above my graph shows my blood sugar before taking my nightly dose of Robitussin. The blue line is the peak of the increase after taking it, when I finally bolused for the rise. All is well now that I know this medicine causes a rise in my blood sugar, and I’ll be paying closer attention to the ingredient listings in the future! 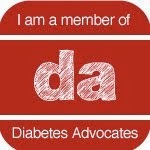 Fellow diabetics, what is something you never even thought to give yourself insulin for?